We love our volunteers. This is a quilt that Dot made. 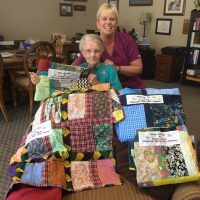 They are lap quilts for our patients. Such a loving act of warmth and compassion. You too can make a difference in the life of one of our patients.